Working creatively within a different cultural environment to your own can be many things – intriguing, inspiring, surprising, and provoking are just a few words that come to mind. As a project leader, you can’t predict all the responses, or the challenges that might arise. I think that’s why I am attracted to these kinds of projects. I like the creative immediacy of thinking on your feet, and being surprised by unexpected turns. This story is about a song that provoked such turns. In the community school of One Arm Point, the ‘maps of the heart’ drawn by students on the first day suggested that culture and cultural learning were important parts of the children’s lives. 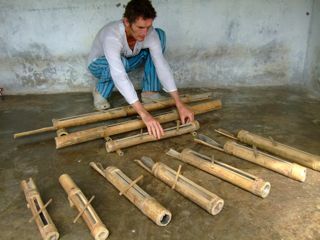 Their maps included particular skills (such as spearing fish, or knowing the local language of the Bardi Jaawi), as well as the lore and laws of the traditional society, which, they explained, were often taught through stories. We loved the song we wrote! It was dramatic, it had flair and punch, and it described a situation that the children spoke about with great eagerness. It felt like it had strong currency for them and therefore for the community. We completed it the day before our concert, and sang through it several times to start committing the lyrics to memory. When we arrived at the school the next morning, the day of the concert, several concerned faces greeted us. “I sang the song to my mum yesterday, and she said it wasn’t appropriate,” said one of the girls. “We’re not allowed to sing that song,” others confirmed, looking anxious. “I don’t want to sing it,” another stated emphatically. I got the sense that their song had caused quite a bit of discussion in their homes. “Maybe we can change some of the words,” I suggested, looking at the lyrics on the whiteboard. But the children still looked uncomfortable, so I went to seek further advice. 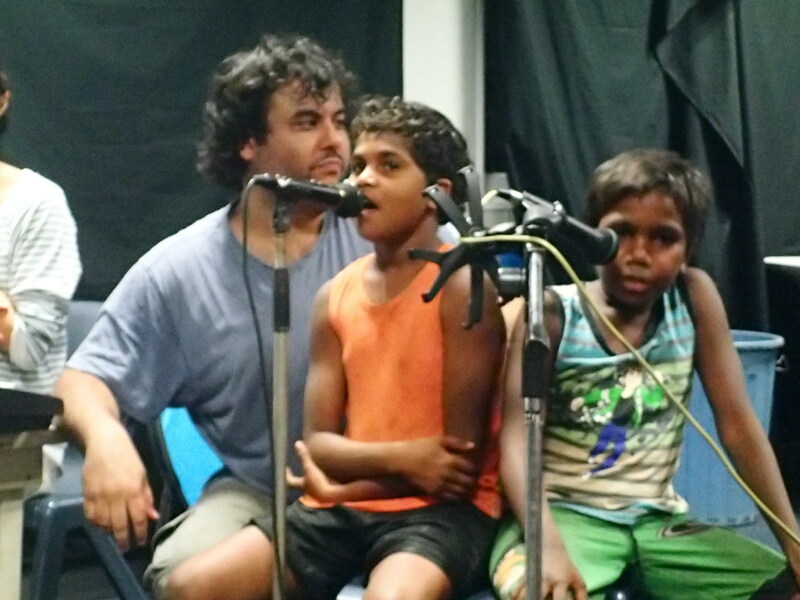 In remote community schools, there are Aboriginal Teaching Assistants employed as well as teachers. 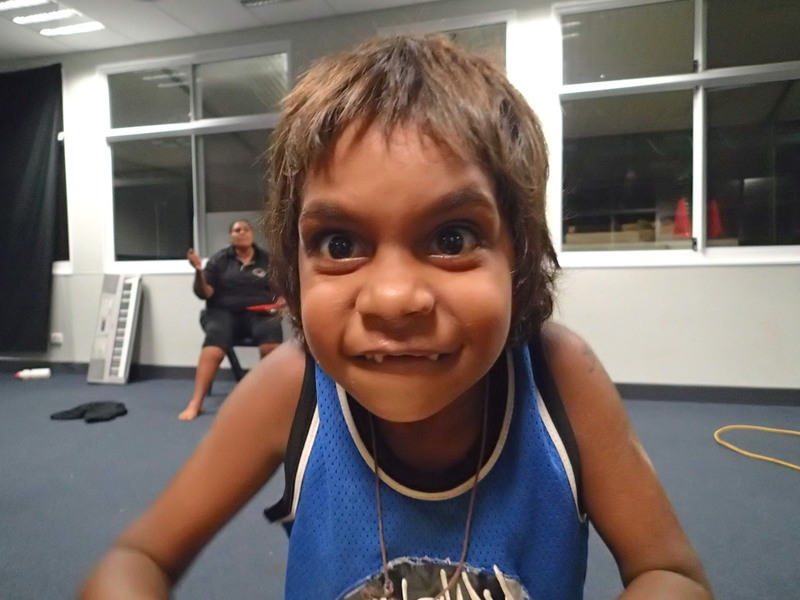 Some of the teachers are also Aboriginal. I asked the principal if there was a community elder among the staff who could advise us on the best thing to do. He directed me towards two women on the teaching staff who came to the music room to see the lyrics of the song. I watched as they read the words, exchanging glances with each other but not saying anything until they had read everything and had time to think. “Yes… I can see why there are concerns,” said one of the teachers. “Is it possible just to change some words?” I asked. 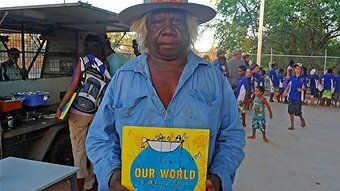 ‘Our World’ is a beautiful book, created by the children and Cultural Program teaching staff at One Arm Point. 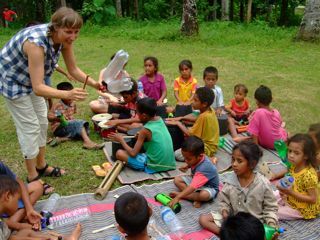 It describes community life at One Arm Point – called Ardiyooloon in the local language – and all the traditional cultural skills and knowledge that the children develop in the Culture Program. Fortunately, I’d bought myself a copy of this book in the local shop the day before. Even more fortunately, it was in the car! I ran to get it, and the teacher-elders looked through it, and suggested one of the stories that we could use as an alternative. I decided not to get started on writing a new song straight away. 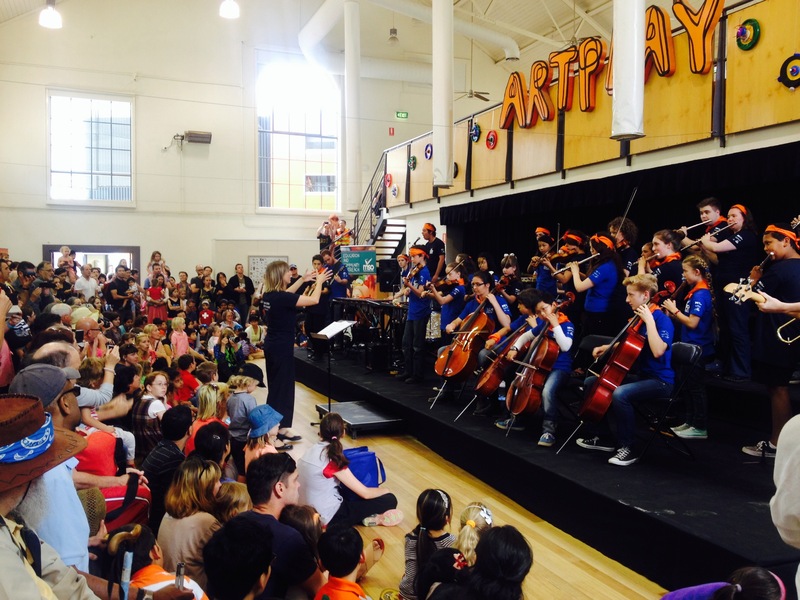 This was our concert day, and we’d started it with a very unsettling problem to solve that had distracted the children and disrupted the positive, excited momentum that is an important part of working towards a performance in a short project like this. We began our workshop with one of our familiar warm-up games, aiming to shift the slightly gloomy, deflated cloud that was hanging over lots of people’s heads, then we rehearsed one of our other performance pieces and recorded it. The story they suggested was a different one again, about Kangaroo and Hermit Crab having a race, which Kangaroo is confident he will win. It is very like the Aesop Fable of the Tortoise and the Hare, but with a small twist, because Hermit Crab plays a trick on Kangaroo in order to win the race. This was clearly a safe option! We thanked the elders for their help in solving this challenge, and set about creating the new song. We split into two groups. 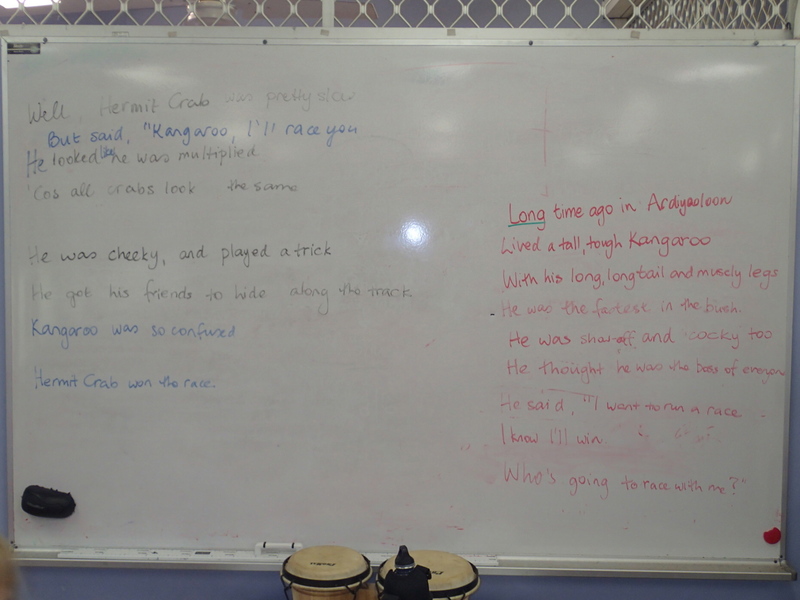 One group went off with Tony to play guitar (writing lyrics can be a slow and painstaking process and isn’t everyone’s cup of tea), and a small group stayed with me to figure out how to retell this new story in the structure and melody of the original song. I am not going to share the lyrics of the original song. It is not my story to share. This is something that became very clear in our discussions with the children, the elders, and others in the community later on. Stories may be heard, but hearing a story does not mean you are the right person to re-tell that story. The story in our original song was one that the children knew a lot about, but it wasn’t a story for children. It wasn’t appropriate that they should sing about this story, nor was it acceptable for them to sing it in a public concert. Moreover, children are given stories. The stories are passed on to them according to traditions or decisions or community/adult choices that are underpinned by thinking that we, as outsiders to the community, are not party to, and should not make assumptions about. We performed our new song at the concert that afternoon. It was received extremely well. The children listening recognised the story (and I introduced it as coming from the ‘Our World’ book). We taught the audience our two-part chorus and invited them to sing with us. That’s an ideal outcome. I think all the children felt safer with the new lyrics. No-one had seemed uncomfortable with the original song the previous day when we’d composed it. But they were happier to sing the new song. For Tony and I, it was the opposite – we liked the original song better! We were fortunate to have people in the school who were able to help us solve the problem quickly. It was also significant that we – Tony and I – are attuned to the challenges of working in cross-cultural situations. Like the experience of the burglary in East Timor, we instinctively handed the problem over to the community leaders to solve for us. We knew that we needed their advice and endorsement, and that they had the knowledge and authority to solve this quickly and calmly. 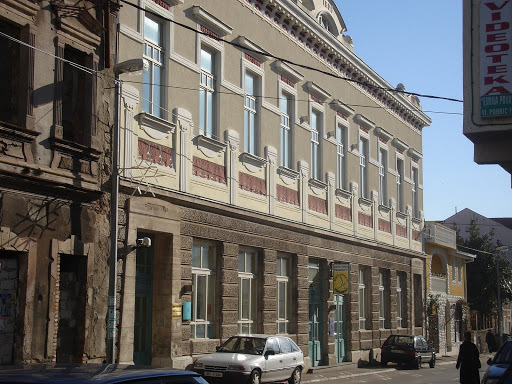 There was no anger towards us – people knew we had not tried to provoke discussion about controversial things or inappropriate topics, that these had simply emerged through the openness and trust we had engendered in the workshops. Rather, it was approached as something that needed to be solved, and people stopped what they were doing that morning in order to help us solve it. Culture is so much more than artefacts or tangible products. It is also about the way things are done. Our original song strayed into the wrong territory, and the community leaders were the right people to guide it back and ensure a positive, welcome outcome for everyone. Had it gone the other way, had we stood our ground and cajoled the children into singing the song that we thought was musically stronger, it would have undermined all sorts of trusts and authority. Firstly, we would have been putting the children in an uncomfortable, even untenable position. They had told us with their voices and their faces that the original song was no longer okay for them. We needed to respect this. And had we gone ahead with a performance of the original song, we would have been undermining, and positioning ourselves beyond or above, the authority of the community and its elders. This could have had far bigger repercussions for ourselves and Tura New Music who run these Remote Residencies each year. We might never have been allowed back! Intangible culture, like the ways to solve problems, or the knowledge of where a boundary has been crossed, is part of the glue that keeps communities strong. Interestingly, this was a line that came up in our original song! When the structures that support the way that things are done get weakened, many other parts of that culture will also be weakened. So the most imperative advice for an artist working in these kinds of settings is always “Ask. Don’t assume. And accept the advice and decisions of the elders”. 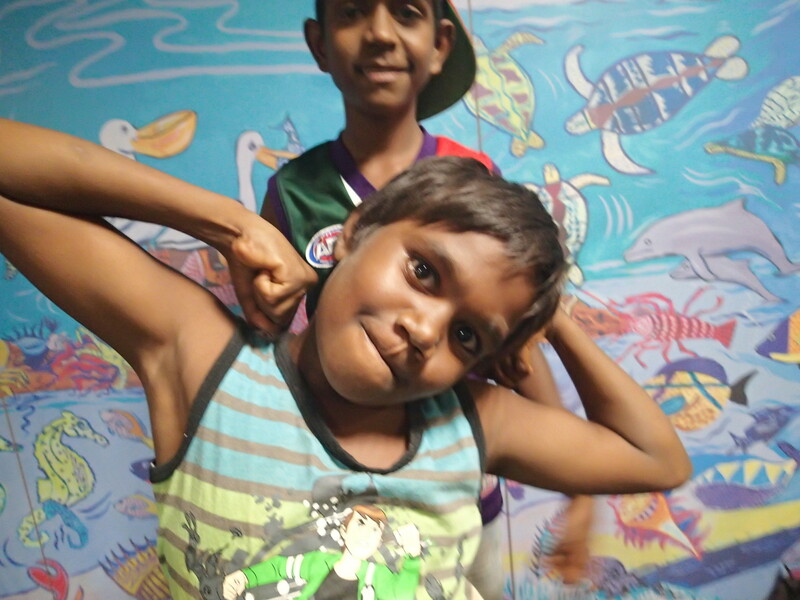 We have been made very welcome here in Djarindjin-Lombadina, a small and remote Aboriginal community on the Dampier Peninsula in Western Australia. It’s a beautiful part of the world, quite remote as it is only connected to Broome by 200km of unsealed, sandy road. There are two little shops, selling a small range of groceries and fishing gear. There is lots of green grass and many handsome trees. 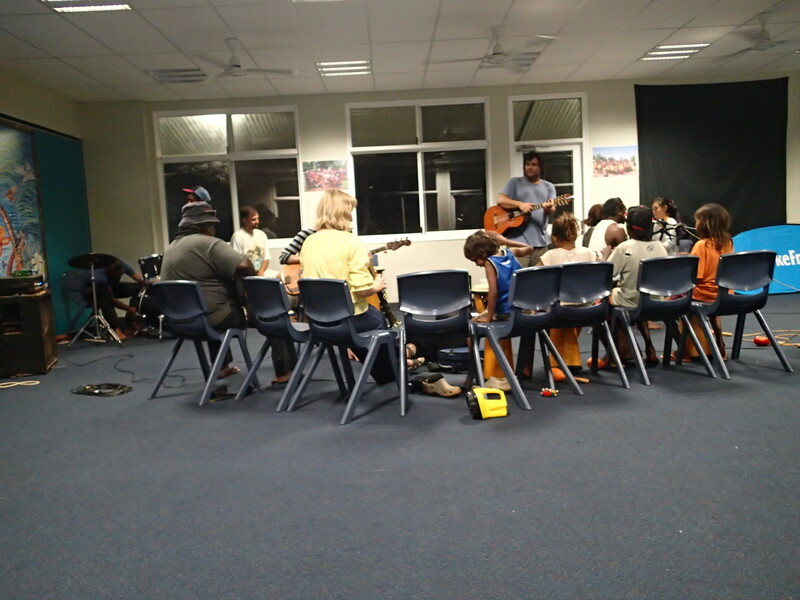 On Saturday evening we took part in a community jam in the school hall with a couple of musicians from the Aboriginal community, three of the teachers (a pianist, a percussionist, and a singer-guitarist), and a crowd of kids. We jammed on various popular hits (Doobie Brothers, Van Morrison, Michael Jackson – those universal classics). 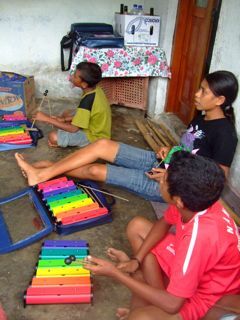 We also played around with a 12-bar blues, inventing lyrics, getting the kids to sing, taking turns with the microphone. It was a magic evening. I gave my camera to the children and they took photo after photo of themselves, doing hip poses and pulling silly faces. Lots of photos! I asked one little girl to take a photo of the drummer for me. She came back with this photo, showing it to me on the screen at the back of the camera. “But where’s Willie?” I asked, showing her the photo. And she looked at it again and started giggling. I think Willie must have decided to duck down when she took the photo. She would have been standing in front of him for a while, taking care to set up her photo. Such a teaser! Yep. It was a fun night. 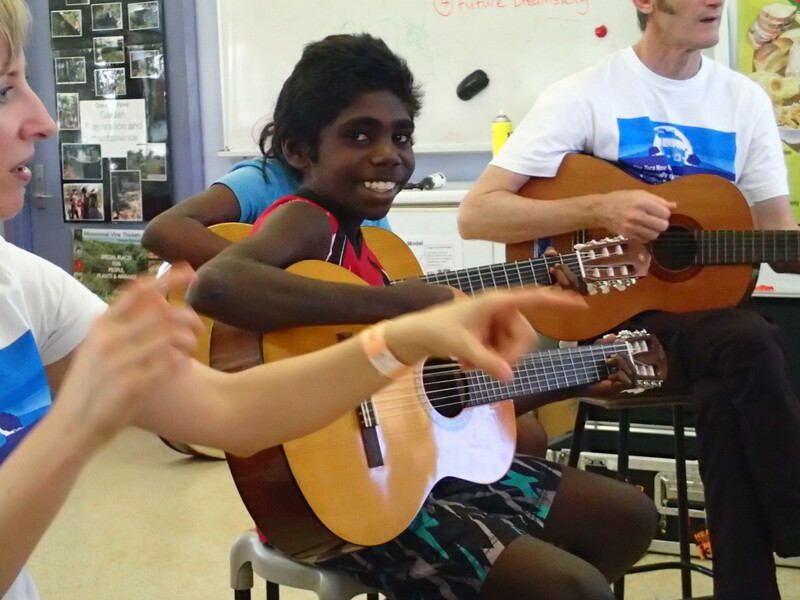 Apparently, this is the first time that this kind of music-making has taken place between the teacher community and the indigenous community, and the teachers were so, so pleased. I don’t know that we can take credit for it happening, due to our presence or influence – I have the impression that the local elders were already planning to have a bit of a jam around now, because they have a gig coming up next week. I think we were just very lucky that it happened on our first weekend. It was a wonderful way to get to know some of the children and just hang out. Music provides the meeting ground. We build rapport and some shared experiences, and hopefully we’ll be able to extend these when our project starts in earnest next week. In any case, being musicians in a community isn’t just about working with the kids. It’s about contributing wherever we can or wherever it is wanted. We went along to Mass this morning (the school is a Catholic school, and the mission is an old Catholic mission, so those traditions are still maintained in the community) and played music for the start of the service. Neither of us are regular mass-goers, but it is an authentic and appreciated way for us to contribute to community life. It’s a very beautiful church, by the way. 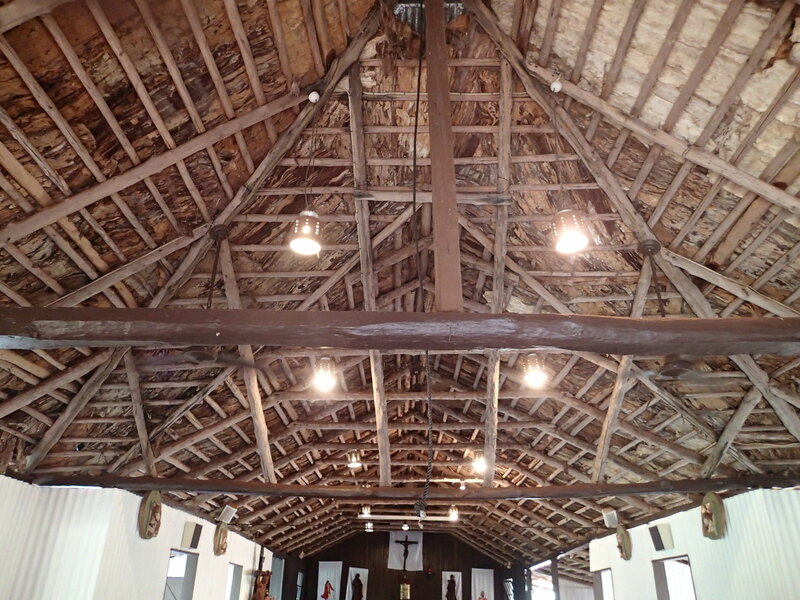 It has a roof thatch made from paperbark – one of the only remaining examples of this style – and it is 100 years old. We have also talked with the teachers about their musical interests, and there are ways that we may be able to support the music projects that are part of their non-teaching lives here in Lombadina. At this stage, it is looking like the 12-bar blues could feature strongly in our end-of-residency concert, with solos for each teacher and a song created by the kids. Last night I put the finishing touches on the score for this weekend’s ‘Gypsy Jam’ at the Myer Music Bowl with the Melbourne Symphony Orchestra [MSO] and graduates from the MSO ArtPlay Ensemble. 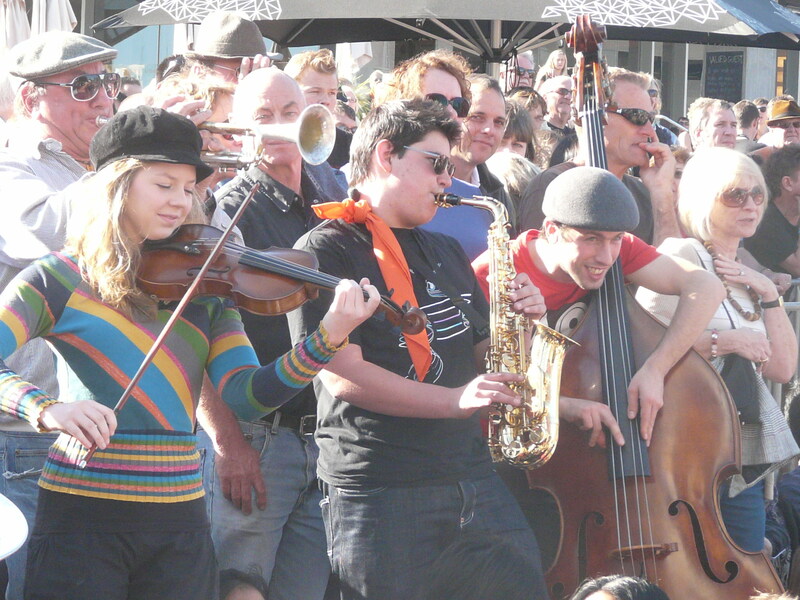 This participatory music jam will take place before a free outdoor orchestral concert, one of a series of four free concerts that the MSO puts on every year as part of Melbourne summer festivities. This year I’ve created a ‘Gypsy Jam’ in order to tie into the concert program which features Bartok’s Miraculous Mandarin Suite. Bartok = Hungarian = Gypsy… purists will know the link is somewhat tenuous, but for our purposes, it’s going to work very well indeed! The jam acts like a pre-concert ‘aperitif’ (after all, people bring a picnic with them to the free Myer Bowl concerts so if the concert proper is the main course then the pre-concert jam could be an aperitif or amuse-bouche), and people can elect to come down to the stage to join in (we’ll have lots of percussion instruments available for them to play, or they can bring their own instrument with them), or join in from their picnic spot on the grass. Thousands of people attend these free Myer Bowl concerts, so that means there might end up being thousands of people jamming. Everyone is welcome, so if you are in Melbourne, pack your picnic basket, grab your horn of choice and head down to the Myer Music Bowl, ready for a 6pm jam start. Gates open at 4pm. Here’s what it looked like last year, when our theme was Mexican (to tie in with the concert performance of Copland’s El Salon Mexico). Olé! Upper Primary finished another section of their Aranea music, for Refugee Week. Today we made a piece called The White Room, depicting the time when Aranea has escaped the brutality of the storm, only to find herself in a bright white room, with no dark corners in which to hide. She still feels scared and vulnerable, bu is also thankful that the storm is outside, and she is now inside. Our music is very atmospheric and eerie. Not a tune or melody in earshot! It starts with a high, thin harmonic on the violin, long and unrelenting. Next, the sound of a hand-held cymbal with a metal stick being dragged slowly around its rim. Then the triangle, held in such a way as to deaden the sound, and played with a stick jiggled tightly in one of the corners of the triangle (sorry for the word ‘jiggled’. What does one call this movement?) In any case, it is very effective, sounding like teeth chattering, or thin bones trembling. Then, 2 more cymbals, this time being brushed with a metal stick in a fast, outward ‘whisk’ movement, every 5 seconds or so. The rest of the class are dancers and singers, with 2 further children on drums, and one on cabassa. They stand in two rows, in a frightened stance, with their shoulders hunched and a hand in a small fist near the mouth. Lonely. (2, 3, 4) Outside. (2, 3, 4). Her heart is running very fast! (The stamping stops on this phrase, and the instrumental group also stops playing. The rhythm of this phrase is then echoed on the two drums). She can’t hide anywhere. Someone could come and kill her! (The rhythm phrase is echoed on the cabassa and violin, and all the cymbals and triangle, held so as to deaden the sound). The sound then stops dead and everybody freezes. End of section. We have one more section to compose. I think it will be a song, a quiet, tired song, when Aranea makes it to a more sheltered place and can finally collect herself. We will then recap the opening song and music. Middle Primary continued their musical time-capsule. They keep amazing me with their gifts for melody and part-singing. Today we looked at Journey words, and my aim was to gather a list of types of transportation the children in the class had used to get to Australia. Car and plane and bus, then train. Car and plane and bus, then train. Car and plane and bus, then train. Car and plane and bus, then train. From Afghanistan to Islamabad! From Afghanistan to Islamabad! Car to grandma, car to plane. Leipzig to Frankfurt and Singapore. We waited… 2 hours. We waited … 4 hours. We waited… 8 hours. We waited 16 hours! It ends very quietly, with each of the children whispering the length of time their own journey took to get here: “It took 3 days…” “It took 24 hours…” “It took 8 hours…” The whispering continues but gradually gets quieter and quieter, until, on my cue, it stops. No more composing needed for Middle Primary. Now we need to rehearse and memorise our four sections of music. Lower Primary today were a bit unsettled. No, in fact, very unsettled. My plan this week was to set their Name Rhythms to specific pitches (that they would choose), to build up three layers, or two call-and-response patterns. By the end of the lesson, we had kind of succeeded in working out the latter, but I have no idea how much of the whole task and process the children were comprehending. It was one of those days for them, I feel. …but my brain already feels a bit mushy. Today and tomorrow I am at the Orchestra. No projects to lead this week so time to be in the office and catch up on administrative tasks – designing content and structure for forthcoming projects. K (the magnificent new Education Manager) and I feel a bit like we are capsizing in white water – strong swimmers both, doing our best to keep our heads above water, but struggling against the strength of the currents that are pulling us in all directions. What would the Taoists say? Go with the flow of the current, don’t fight it, let it take you where it will. I am not sure how this wisdom applies to our overworked environment just now…! We certainly have some interesting work coming up. 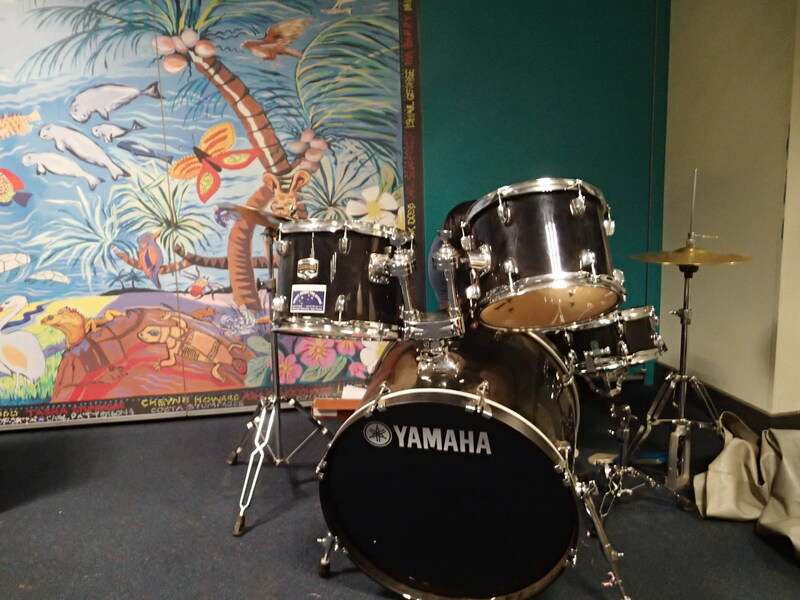 Soon we will start workshops for our residency project, at a primary school in the Western suburbs. 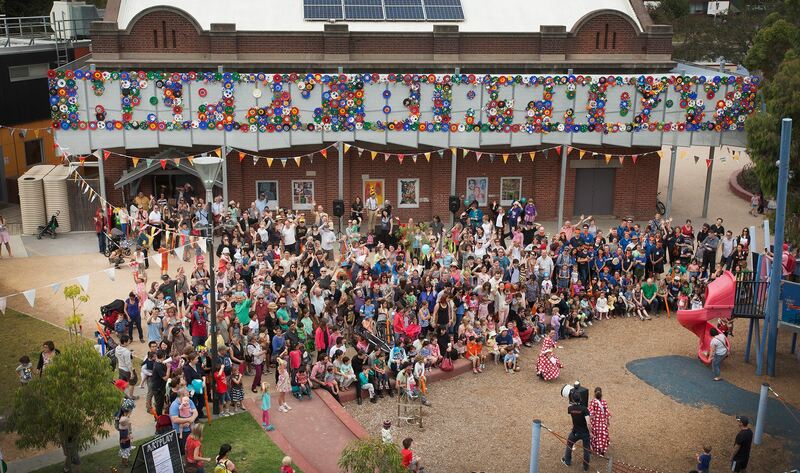 This is a pilot project for the State Government’s arts funding body, and there is a focus on improved education and school outcomes, rather than just on making the arts happen in the school.